« Tickets to Speaking Volumes here now! 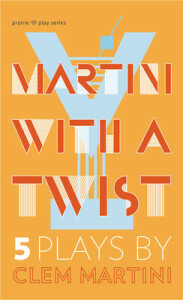 Clem Martini’s volume of one-act plays delivers what its title promises: Martini with a Twist. The latest and thirtieth in the important Prairie Play Series from NeWest Press is an attractively packaged and appropriately titled cocktail of a book full of perspective-challenging and -altering garnishes. The collection is a testament both to Martini’s insistently theatrically playful creations over two decades, from 1989 to 2009, and to Calgary’s Lunchbox Theatre and its history of supporting and producing the one-act play. One-acts don’t always get the respect they deserve, but they can really pack a punch. In this case, the punch always comes from an unexpected direction, accompanied by that titular twist. Indeed, the plays here that are almost too long and large for one-acts, The Life History of the African Elephant, Nobody of Consequence, and The Invention of Music, which respectively call for an elephant trunk, a talking head-in-a-box and a pod of whales on stage, are the ones that both most confound and most engage. Simply put, the more playful the theatrical semiotics (and the more challenging to pull off technically), the more compelling the plays. The collection begins very strongly with The Life History of the African Elephant, first produced by Lunchbox Theatre in 1989. The theatrical elephant in the room is literally that. The play takes place in an elephant enclosure and requires a fully functional trunk to swoop through the space, picking up bananas and spraying water when required. The dramatis personae include an elephant handler bitter at being too tall for his family of wrestling midgets, a one-eyed optimistic artist who perpetually runs into things and her brother, an arsonist on a day pass. The playful semiotics of the piece (which include a character who “sight height” reads, and a twist that requires actors of particular and unusual heights) are on display from the beginning when Florence, the artist, introduces herself to Glen, the elephant handler: “I’m your neighbour on the northwest side. Northwest? The sun rises through the duplexes across the street runs a parallel course to the axis, yes, northwest. You probably haven’t noticed me, have you?” (15–16) Though there are some suggestions of a plan to smuggle Mkuki (the pregnant, depressed elephant) out of the zoo, no direct actions take place. The play instead offers a whimsical surreal theatricality that, like Tom Stoppard’s After Magritte, all makes sense in retrospect. Throughout this peripatetic journey the play is able to touch on prison, freedom, fate, chance, speciesism and complex sociological structures, and is able to come to a kind of revelatory quirky hope if not concrete action: “If there is a God, it means maybe that he doesn’t hate us. It’s possible he doesn’t love us, or like us, but at least he doesn’t mind us particularly. And I find that kind of thrilling” (60). The next piece, Nobody of Consequence, first produced at Lunchbox in 1990, is even more category bursting in terms of length and technical difficulty. This time Martini challenges his interpreters to convincingly move a living head in a box around the stage as the play explores what life is worth and what kind of life is worth living. This play begins with cynicism as Margaret and her lover Leslie celebrate the success of their plan to kill her husband Dave for his money. Leslie, a plastic surgeon, articulates their cynical materialism: “Patients come to me not [to] find out how I feel, but how society views them, and society’s view is uncompromisingly towards perfection and symmetry. Which, humans being what they are, assures business will remain brisk” (66). However, Dave has survived, or at least he has survived as a head in a box who will be coming home shortly. Despite his new state, Dave is now irrepressibly optimistic, viewing his miraculous rebirth as a “head start” on a new life and rejecting his accounting past. Leslie and Margaret, even more annoyed by the new Dave, try to end this odd love triangle by repeatedly attempting to kill him, but fail or are foiled with the help of Dave’s bird-watching pharmacist neighbour and friend, Cliff, whose addition makes for a quirky quadrangle of sorts. As in the first play, this one too has an ending that twists away from the expected. The triangle evaporates rather than exploding in violence or resolving with justice and the three reach a financial agreement and go their separate ways. A wiser and much less hopeful Dave seems left alone in despair but, instead of complete self-aware bitterness, we are left with a more hopeful non-traditional comic ending, with the head and Cliff sharing a beautiful friendship. Like Vladimir and Estragon, Dave may not be able to move but he will move on. The next two plays in the collection are the shortest and the slightest. Both The Replacement, first produced at Lunchbox in 2002, and Spill and Spell, first produced by Nickel and Dime Productions at the University of Calgary in 1994, are less challenging and, therefore, less engaging. They simply do not twist enough. The Replacement is the story of a dinner date for a widower attempting to return to the dating game with the help and hindrance of the ghost of his dead wife. The content of the date itself is quirkily charming: his “date” stutters, suffers under the dominance of an offstage oddly confident monstrous bird lady, and has brought a resume to try to make it a job interview for a position she has no qualifications for. However, both the ghost as character and the happy romantic comedy ending are in too well trodden a theatrical path. Spill and Spell’s twist is that the new girl playing the title game can smell lies and that, surprisingly, all the girls end up liking the uncomfortable revelations. This piece is probably a useful play for student actors but is, as the title implies, more of a fun game than anything else. The final play of the collection, The Invention of Music, first produced at Lunchbox in 2009, returns with a vengeance to format-challenging staging difficulties. This time the large mammals are onstage and “underwater.” The actors must embody Bill, an insecure blue whale; Hector, a singing humpback; Frank, an angry finback whale; and finally Kira, a killer whale thrown out of her pod for falling in love with her food – Hector. Martini requires the actors to constantly undulate physically in order to convey the environment and to periodically surface for air. At its most challenging, Frank has to eat a human swimming above, thrash around with it in his mouth and eventually spit it out. Again, through these absurd extremes, the play captivates while at the same time probing larger questions of existence, responsibility, tribalism, love, speciesism and the overarching need to find a just and reconciled way forward. Kira speaks for all of us when explaining why she is present: “So you can stop lecturing me. I’ve been lectured. I’ve been cast out of my pod. How desperate do you have to be to fall in love with your next meal? I don’t know. But I am desperate. I’m completely, totally desperate. I wouldn’t be here if I wasn’t” (217). And, of course, the point is that she is here trying to find some way to fit in, to find some way forward. William Kerr is an associate professor of theatre in the Department of English, University of Manitoba. His major field is dramatic literature, practice, and theory. He also directs and acts, most recently at the 2015 Winnipeg Fringe Festival. Edmonton: NeWest Press, 2012, ISBN 9781927063163, 208 pp., $19.95 paper. Buy Martini with a Twist at McNally Robinson Booksellers. This entry was posted in All Reviews, Book Reviews, Drama. Bookmark the permalink. Both comments and trackbacks are currently closed.